Artefacts from the original HMS Victory could finally be salvaged from the bottom of the English Channel a decade after the wreck was found. 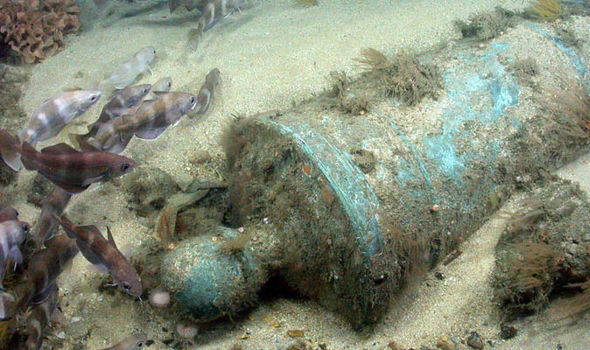 A multi-million pound plan to excavate 50 bronze cannons, as well as the rudder, rigging and wine bottles has been presented to the Government. The Maritime Heritage Foundation is hoping Defence Secretary Gavin Williamson will give his consent to push ahead with the salvage before the wreck – which lies 50 miles south of Plymouth – is further damaged by tides, deep-sea trawlers and looters. The first-rate warship Victory was launched in 1737 with 100 bronze cannons on its three wooden decks. It was the predecessor to Lord Nelson’s Victory. More than 1,000 sailors died when the top-heavy flagship, the size of a village, sank in a storm in 1744. It was seen as a national disaster with Britain at war with France. The wreck was found in 2008 by Odyssey Marine Exploration, a US deep-sea salvage company, which will tomorrow symbolically sign over the £100 reward for finding it to the foundation. The Admiralty offered this sum back in 1745, which would have been paid in 95 gold guineas. These coins would now be worth £342,000 but the foundation, which was gifted ownership of the wreck by the Ministry of Defence in 2012, will accept £100 in modern-day currency in the hope it will be allowed to start its excavation work.